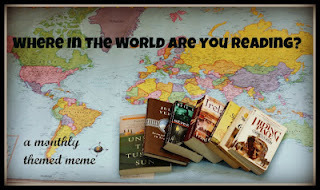 "Where in the World Are You Reading?" is a monthly themed Meme jointly hosted by Trish at Love, Laughter and a Touch of Insanity, Lisa at Books. Lists. Life. and Kailana at The Written World. "Where in the World Are You Reading?" è un meme mensile gestito da 3 bloggers: Trish di "Love, Laughter and a Touch of Insanity", Lisa di "Books.Lists.Life" e Kailana di "The Written World". Click on any of the links for the post that explain the details of the Meme. It's never too late to join in so please consider doing so! Cliccate su uno qualunque dei link ai tre blog per conoscere tutti i dettagli del meme. Non è mai troppo tardi per partecipare! The theme for July is Your Local Bookstore so this post is about my local bookstore. You can see the other posts for this month at this post on Trish's blog. Il tema di luglio è "Your local Bookstore" così questo post sarà su una delle librerie di Bologna. Potete vedere i post degli altri partecipanti in questo articolo sul blog di Trish. One of the things that certainly isn’t lacking in my hometown is bookstores; sure, enthusiasts like us would love to have more, but the ones we already have are actually very good and offer a great selection of books. Here in Italy though, and not just in Bologna, we’re definitely missing more “Indie” bookstores. Una delle cose che di sicuro non manca nella mia città sono le librerie; certo, per degli appassionati come noi non sono mai abbastanza ma, quelle che ci sono, sono molto valide e ben fornite. 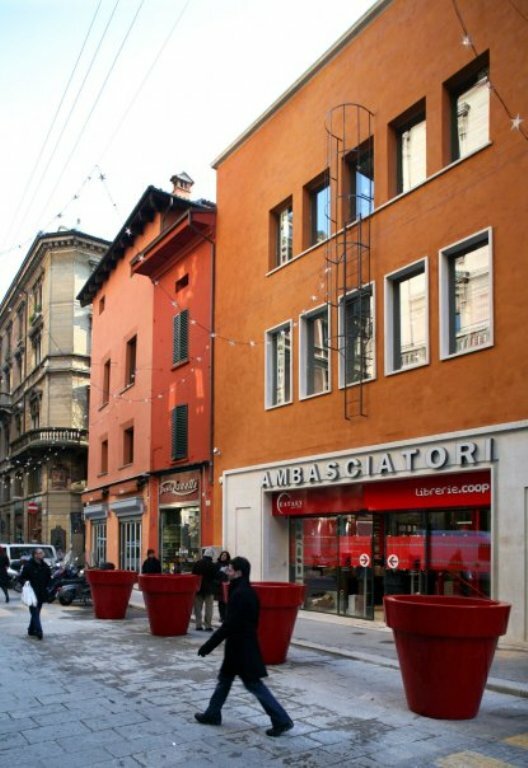 Quello che manca è qualche libreria “indipendente” in più, ma questa è una mancanza dell’intero panorama italiano e non solo di Bologna. The bookstore "Ambasciatori" isn’t the only one I regularly go to, but I decided to present you this one because it’s definitely the most peculiar. The bookstore is located in the city center, inside an ancient building, that has always been part of the town planning. What immediately strikes you is the ultra-modern design of the internal structure, enclosed by glass walls that make it look like a huge greenhouse, and beautifully let the light shine through the whole store. La libreria “Ambasciatori” non è l’unica che frequento, ma ho deciso di presentarvi questa perché è sicuramente la più particolare. 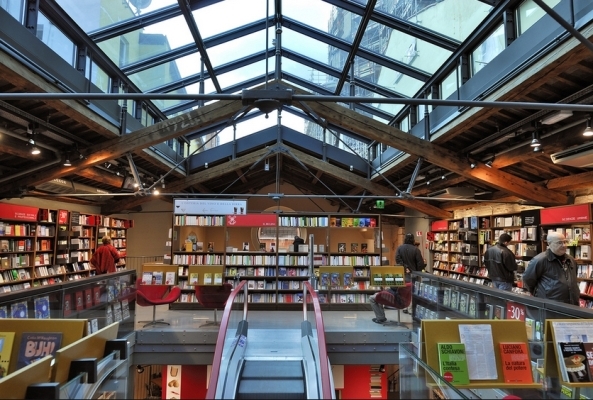 La libreria è nel pieno centro di Bologna e l’edificio in cui si trova è una struttura antichissima, che da sempre fa parte dell’urbanistica cittadina. 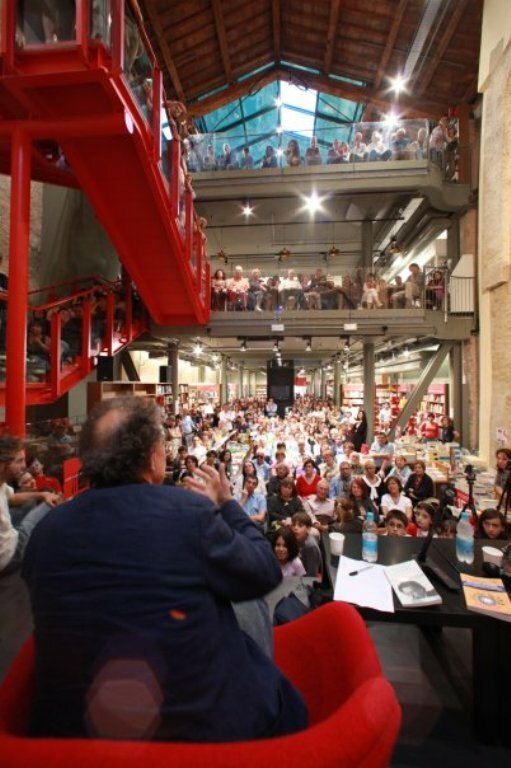 Quello che colpisce subito è il design ultramoderno della struttura, racchiusa da grandi vetrate come se fosse un’enorme serra, il che conferisce una bellissima luce a tutta la libreria. Not only will you find books on the three floors of “Ambasciatori”, but a lot of great food: "Eataly" – in fact - with its two restaurants and a bar, is part of the store; they serve you dishes made from the finest Italian materials, and serve them in a lovely place, where you are surrounded by books. 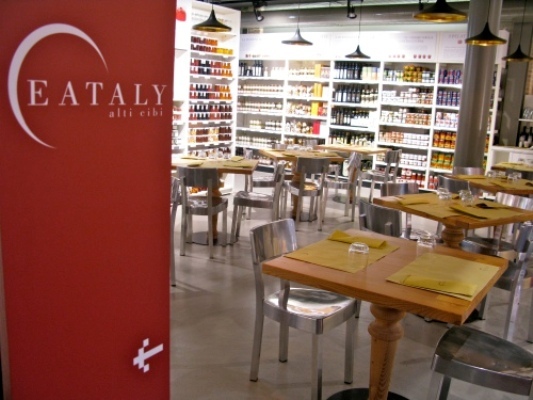 By the way, "Eataly", has worldwide locations, including New York and Tokyo. 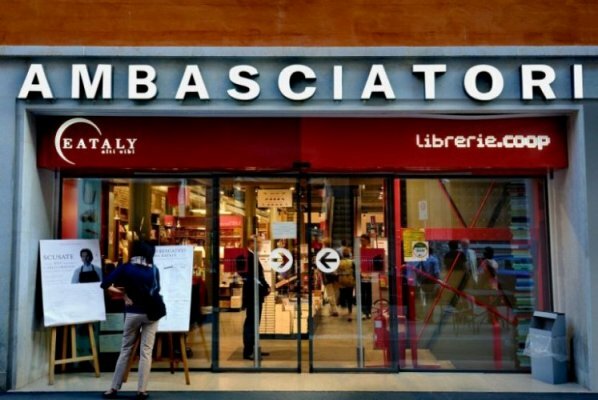 Nei tre piani che compongono il negozio non troverete solo libri, ma anche tanto ottimo cibo: all’interno della libreria “Ambasciatori” è infatti presente “Eataly” con due diversi ristoranti e un bar, dove vengono serviti piatti preparati con le migliori materie prime italiane in un ambiente delizioso, nel quale si è proprio circondati dai libri. 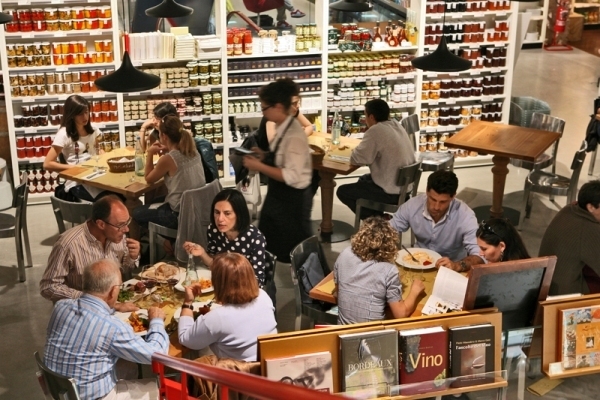 “Eataly”, oltre che a Bologna e in alcune altre città italiane, è presente nel mondo a New York e Tokyo. I want to end up leaving you a few more pictures of this awesome bookstore, suggesting you visit this great place whenever you have the chance! Concludo lasciandovi ancora qualche foto di questa bella libreria, consigliandovi di farci assolutamente un salto la prima volta che passerete da queste parti! Wow. That is stunning! I want to go eat there. 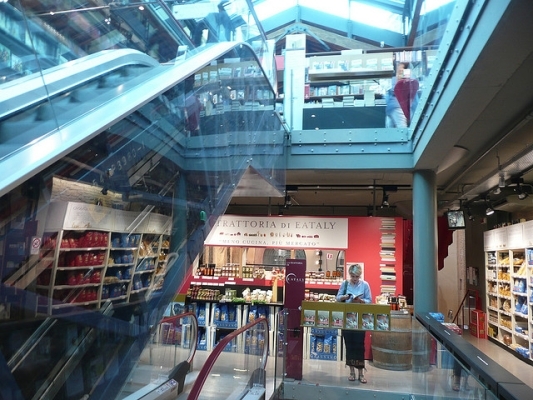 I Love the red staircase and the beams and the glass ceiling. Thanks for joining us! before becoming a bookshop, the building hosted a red light movie theatre! This place is huge!!! I love the ceiling. That is a fantastic bookstore! I love the natural light and the modern architecture. 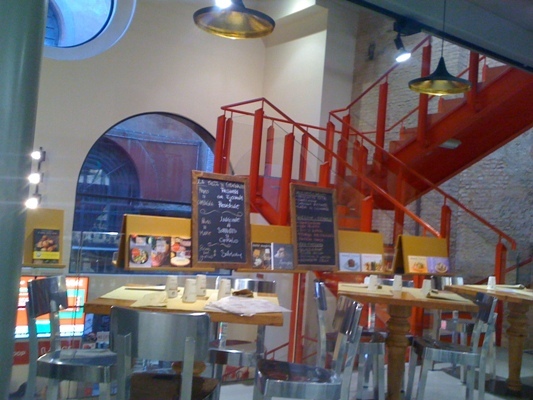 And Eataly! Thanks for posting about it. Wow! 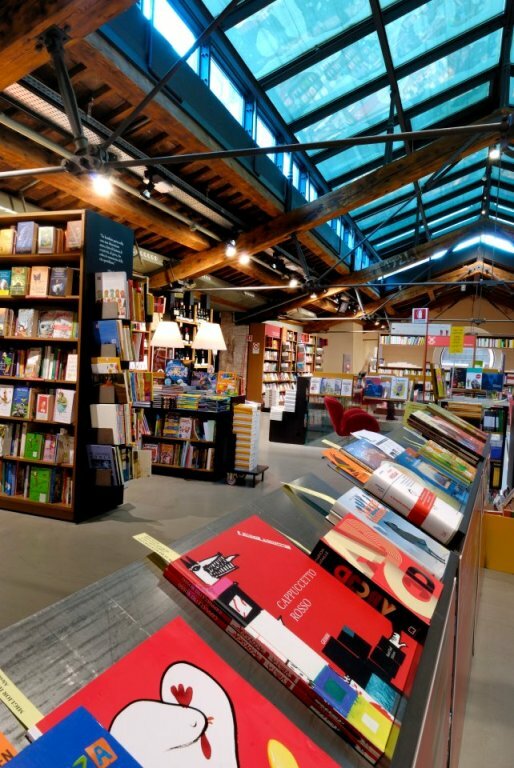 As if there weren't already enough reasons to visit Italy, this bookstore is another reason for a trip across the ocean! Thanks so much for participating Valentina! The storefront is really deceiving for what is found on the inside of the store, huh? I really love all of the open light coming in. Looks like a great place to get lost for a few hours. 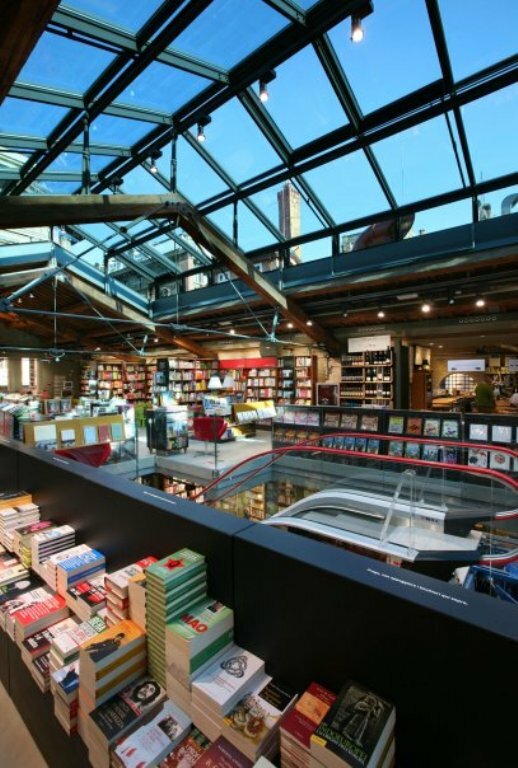 What an amazing bookstore - and just one more reason to visit Italy!! I could spend hours browsing there. Thanks for all the photos.